What can one say about a fine writer —Bret Easton Ellis— who chooses a degenerate and violent theme? To me it seems like a waste of talent. But to each his own! Why lament the fact that Flaubert –another superb writer—chose to write about infidelity, adultery, the provinces, and a low-witted heroine? 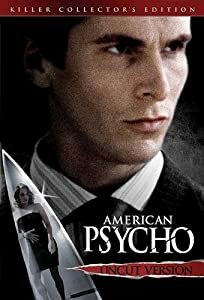 Yet the fact remains that while Madame Bovary is a masterpiece regardless of its theme, American Psycho is a minor work. American Psycho is a scary book for whoever reads it, be the reader male, female, gay, lesbian, straight, or crooked. But, besides the gratuitous violence, what makes this book scary? It isn’t a novel in the vein of those horror adventures that Stephen King writes. Not at all. This book is disturbing not because of the horror of the violence it contains, but because of what it represents: the acts, realities, and fantasies of a narcissistic killer that not only makes a killing in the market, but who is also a serial killer. Beneath the well polished, well groomed, and sartorial splendor of the anti-hero Patrick Bateman, lays a soul-less predator intent on gratifying his most base and mad passions. This character’s confessions will put you out of your comfort zone and get in your face for sure. But not everything is violence, banality, and frivolous. Humor is there for the reader to inhale when is needed. The pace demands moments of hilarity, or readers would get fed up with the continuous iterations of objects, clothes, clubs, and cabs. And if hilarity is missing, you’ll find sarcasm everywhere. For those who aren’t familiar with the world of investment banking (Drexel, Lehman’s, Kidder Peabody, First Boston, Morgan Stanley, Rothschild, Goldman, and others), it’ll be an eye opener. To think that yuppies —graduates of Groton, Lawrenceville, Milton, Exeter, Kent, Saint Paul’s, Hotchkiss, Andover, Choate, Harvard, Yale, Columbia, and other Ivy schools), earn large bonuses and salaries, will make many people unhappy. Excess, wealth, and opulence are visible everywhere: Bergdorf’s, Fortunoff, the Harvard Club, The Pierre Hotel, Café Luxembourg, Café des Artistes. Maybe this is where the satire resides. The author is painting a grim landscape of a segment of society that has indeed become a dog-eat-dog jungle where remorse, conscience, and moral imperatives don’t exist. Bret Easton Ellis uses his command of the English sentence to shape an emotionally numb and de-personalized character that thrives in the 1990's yuppie culture. While we read we feel immersed in the thick of the action and we overlook grammar, syntax, and rhetoric that the author employs to accomplish his literary goals: alliteration (“You are pure prep perfection,” he purrs), altered syntax (“Just like a leaf I’m shaking), and exciting sentence openers. My conscience, my pity, my hopes disappeared a long time ago (probably at Harvard) if they ever did exist. There are no more barriers to cross. All I have in common with the uncontrollable insane, the vicious and the evil, all the mayhem I have cause and my utter indifference toward it, I have surpassed. I still though, hold on to one single bleak truth: no one is safe, nothing is redeemed. While we admire the confessions of tortured souls like Augustine, Rousseau, and Tolstoy, we abhor Patrick Bateman’s telling. Since there’s no redemption for the protagonist of the novel, we can well say that, the novel while entertaining and well written sentence openers, has no social redeeming value and will remain a minor work in American letters. Comments on "Well Written Sentence Openers in Bret Easton Ellis’ American Psycho"